The iQ Series Work Zone Radar Speed Signs offer solutions for increasing driver speed awareness and road safety in the extremely dangerous arena of construction zones. The bright 15” characters can be seen from up to 1,000’ away, and help increase driver speed awareness and which better protects road construction workers. This iQ Series of sign includes SafetyCalm™ configuration and data collection software allows you to gather hard data of traffic patterns and program the sign using a bluetooth connection from your laptop. 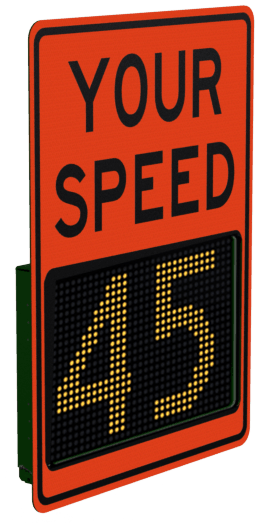 TraffiCalm Work Zone Radar Speed Signs are manufactured in the USA in an ISO 9001:2008 certified facility, meeting and exceeding industry standards and state testing requirements. The 15” TraffiCalm Work Zone iQ Signs are UL/ULC listed for electric code compliance. TraffiCalm signs are unmatched in durability, accuracy, ease of use and affordability. Package Includes: Work Zone Radar Speed Sign, mounting bracket, SafetyCalm™ Configuration and Traffic Data Collection Software, installation and user manual.